Don’t Miss This! Last Chance for FREE SHIPPING! Don’t miss out! Today is the final day to take advantage of one of our most popular promotions — FREE SHIPPING! 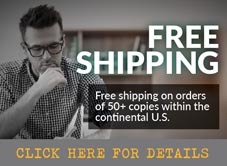 Authors who have published with Outskirts Press can get FREE SHIPPING on book orders of 50 or more with UPS Ground shipping within the continental United States. If you’ve been wanting to restock books for book signings or save more money by ordering in bulk for your direct sales efforts, now is the time to take advantage of our most popular promotion for published authors! No promotion code is necessary. You will see the free shipping reflected during your order. Easy, right? Click below to place your order. Time is running out, so place your order now so that you don’t miss out on this free shipping opportunity! Previous Previous post: Ends Today: Take 20% Off!